Back when I was a freshman attending a rather large state university in Austin, Texas, I ran into quite a few students (relatively speaking) from the state of New York. They told me that they were attending college in Texas because our out-of-state tuition was cheaper than their in-state tuition. I only saw them that one year because the following year, the legislature raised out-of-state tuition and Texas was no longer as appealing to New Yorkers as it once was. That sort of situation isn’t as common today as it once was but it still happens. Based strictly on an average of all the states’ public universities total cost of attendance (not weighted), students who are residents in four states (New Jersey, New Hampshire, Pennsylvania, and Connecticut) could find it cheaper to attend public universities in South Dakota, North Dakota, Nebraska, Oklahoma, or Minnesota. Of course, that’s assuming the students don’t qualify for any need based aid at their state university. And any cost savings would probably be lost in travel costs and the like making the entire proposition a wash in the end. However, out-of-state tuition is a major concern of many foreign students who don’t qualify for in-state tuition in any state. The average total cost of attendance for out-of-state residents at public colleges is $35,174 for 2017-18, up from $33,943 in 2016. The number of public universities where the out-of-state cost is over $40,000 has increased from 115 to 138. Among those, 35 charge more than $50,000 and 11 of those, in California, Virginia, and Michigan, are over $60,000. Given that there are now 53 state colleges that have a total cost of attendance over $30,000 for in-state students, I’ve decided to increase my cut-off for “low-cost” out-of-state total costs to $32,000. There are 190 public universities with out-of-state total costs below this level. A total of 66 have prices under $25,000 for non-residents. Georgia and Texas have the most colleges with a total cost of attendance of $32,000 or less with 15 schools each. Oklahoma and Wisconsin tied for second with 11 colleges each on the cheapest list. Michigan, Minnesota, and Missouri followed with 9 schools. A total of 12 states don’t have any schools that make the list of colleges with cheapest cost of attendance. Another 8 have only one school on the list. Of schools with a total cost of attendance (out-of-state tuition and living expenses) less than $32,000, only 28 qualified as 50-50 schools. These are schools that accept at least 50% of students and have at least a 50% graduation rate. Wisconsin has 5 of them and Massachusetts, Minnesota, Missouri, and Pennsylvania have 3 each. A total of 31% of all the schools have at least a 40% five-year graduation rate. There are other ways to lower the cost of attending a public university out-of-state. If students live in one of the four regional tuition discount programs, they may be eligible for lower tuition. These programs allow students from member states to pay lower tuition rates. However, there are often limitations such as participating colleges and allowed majors. Student who live along state lines should check for any local exchange agreements. There are other ways of lowering the cost of out-of-state tuition at public universities. Some universities provide in-state tuition to non-resident students who have minimum academic qualifications. There are also colleges that will charge in-state tuition if the student qualifies for certain scholarships. In some cases states actually make it fairly easy to qualify for in-state tuition. However, these tend to be the exception rather than the rule. Thank you for sharing this, Michelle. Although these may be inexpensive out of state school choices, the quality of these schools vary. As you indicated, it is likely that there is a close-by, high quality, small, liberal arts school whose “net tuition” (published tuition minus average scholarship given) is competitive or even lower than paying out-of-state tuition at a public university. For example, Missouri Southern in Joplin, MO is on the spreadsheet. About 110 miles away, in Point Lookout, MO, is College of the Ozarks. Almost all of the ranking systems rank College of the Ozarks significantly higher than Missouri Southern. Yet the net tuition for College of the Ozarks is $11,212 while net tuition for out-of-state students at Missouri Southern is $13,546 according to http://www.collegefactual.com. 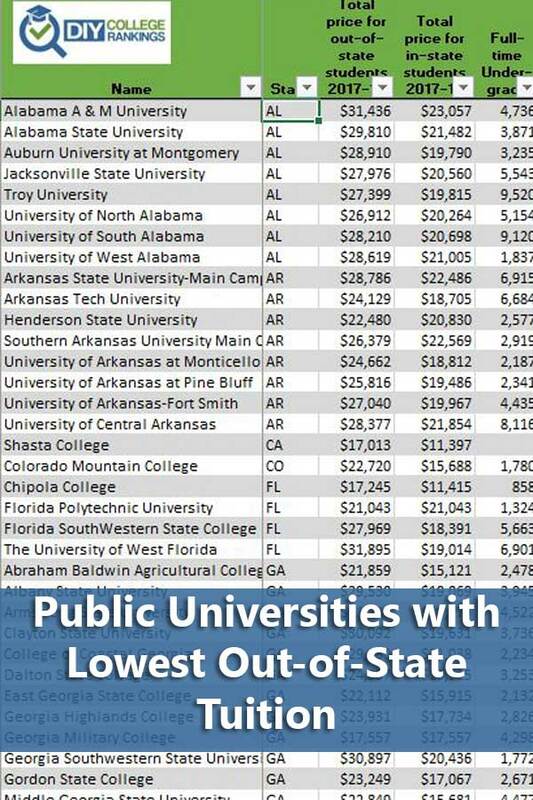 Clearly, College of the Ozarks is the better value between the two schools for non-Missourian students. I completely agree. In general, I think this list is valuable for those who don’t meet the financial aid deadline for private schools and therefore aren’t likely to receive significant financial aid to reduce the cost. Then there are cases such as international students who have a harder time qualifying for financial aid. And apparently, there are some people who will just insist on attending an out of state college no matter the circumstances. Just an FYI regarding Michigan’s Lake Superior State University. As of this school year, they only charge one tuition rate regardless of residency. Thanks for posting! The most current data will always be from the schools themselves so be sure to check.